While Rangers’ performance last night was a mixed bag, albeit the effort from all the players was bang on and grafted out a well-earned point in a tough match, one clear indisputable fact emerged which exposed the silly politics behind the scenes for what they are. 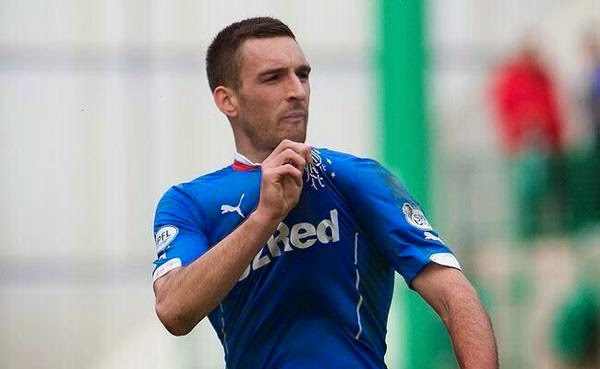 Neither Jon Flanagan or Andy Halliday is a ‘better option’ than Lee Wallace, and anyone saying otherwise is patently incorrect. We believe Steven Gerrard is being hamstrung by a political decision by the board, and one he’s having to respect, and as such when directly asked why Wallace isn’t involved, has to spout a corporate line. No way does a football legend like Gerrard who knows as much about the game as he does think either Flanagan or Halliday is better at LB than the Wallace, and we defy anyone to suggest otherwise. No, last night’s chronic showing from Flanagan along with Halliday’s recent struggles in that alien slot only further enhance the case for Wallace, but evidently his race at Ibrox is run whether Gerrard likes it or not. What happened last season clearly still reverberates around Ibrox and the former club captain has been totally rejected by the powers that be. Of course, there is a chance we’re wrong. That this is a pure football decision – that Gerrard genuinely does think Flanagan and Halliday are better options. We’d respect his call but heartily disagree with it. But after last night, it seems plain he is not a better bet than Wallace. Get Wallace back in right now. Absolutely pathetic he's not being picked. He stood by us so should he not be given his chance ?. Well said RW . Flanagan is not in the same league as big Lee. What would you give to see Lee at his best again. This nonsense should end now. Play him now. Unfortunately the arrogant arseholes that run our club are unlikely to listen to the fans. I totally agree,, Wallace is a legend in my eyes, it's a disgrace not to play him,, Get Murty TF. I can never get my head around why some professional footballers cannot kick the ball using both feet. How many times has an opportunity to make a killer pass by Flanagen been wasted because the ball is on his left foot. With the game being played at such speed now those milliseconds of delay switching the ball from left foot to right are nothing short of criminal.He should be on the training pitch day after day doing nothing but hitting the ball with his left foot. Wallace is better than Flanagan and Halliday at Left back but how fit is he ? He was out injured for over a year .How does he get match fit without playing games when we can`t afford to expose him when he is not match fit . Its a Catch 22 , but he should be playing every reserve game in my opinion. Wallace is not a better option, he is not good enough. GersJimbo and IN. Approaching the Festive Period I would love agreeing with all of your points, and nearly did. Whilst Halliday has done .himself, SG and the fans proud by proving he's better than HE was last year. PROBABLY better than Andy and Pandy. IF He is back to his old energetic self, he'd need lots of match fitness before European football. We don't have that option to take chances. For one I would love them to settle their rift. I think its wrong to blame him or GM as we'd be guessing. But Waldo IS talented, and a nice guy. Time to smoke the peace pipe. What goes in my ciggie paper Stays in my roll up. Hes Tall, Hes Strong, Hes Quick and He can Cross a Ball! He Sacrificed Everything for Us! Moot point as he wasn't included in our European roster so he couldn't have played last night. Also Baresic is on the verge of returning so once again Halliday and Flannigan will be dropped to the bench. I thought we played Helen flannigan in our team the boy is mince nightmare waiting to happen sg hands tied I think from upstairs murty p45 has not got a scobby doo Wallace deserves a run even if sell on value as contract counts down business sense from upstairs if they have a scobby moneys money every penny counts or will they just let his contract wind down leave for nothing and come back to bit us? Although I'd have to agree that Wallace, if fit and even close to being back to the standard he can play at is easily better than Halliday or Flannigan I can't see Gerrard being bullied into not playing him, and the fact that he has used him, all be it for only a minute or 2 proves this. Why would the board put pressure on Gerrard to make sure he doesn't play when they could have payed him off and allowed him to move on at no extra expense. Having a player like Wallace in the squad not playing because of politics would have a big detrimental effect on the squad and he's still training with the first team & I believe playing games for the reserves. I think that Gerrard was being honest when he said he felt he had better options even if none of us can understand why.